When Kendra Saunders finds herself being stalked by a strange man, Barry steps in to help Cisco's new girlfriend out. The three of them travel to Star City, where Team Arrow agrees to keep an eye on her... right until she is kidnapped by a winged man! At the same time. Harry Wells and Caitlin Snow develop a serum to increase Barry Allen's speed and try to test it on an unwilling Jay Garrick. It's a little unbelievable that Cisco - given how much of a geek he is about the superhero thing - would forget to NOT call Barry by his real name in public. Why does Barry run to get Ollie his archery gear instead of charging Savage? For that matter, why does he only get Ollie's archery gear and not Thea's? It's a little out of left-field that Jay Garrick - who has been presented as a straight-forward scientist until now - should believe in The Speed Force as a semi-mystic living element. Honestly, the whole cast is on fire here. But the chemistry between Carlos Valdez and Ciara Renee is particularly noteworthy. Valdez has been given a lot of good material to be more than something besides comic relief this season and the romance between himself and Kendra is believable and wonderful. It will be interesting to see how Carter Hall changes that dynamic. The special effects of Barry racing Savage's knives are impressive, even by the standards of the show. The fight scenes are all fantastic, but I specially liked Green Arrow vs. Hawkman. Kendra Saunders first appeared in the 1999 JSA comic. Kendra's great-aunt, Shiera Saunders, was the original Hawkgirl and Kendra took up her legacy. Or so she thought. It was revealed later, over the course of the Return of Hawkman storyline and the Hawkman comic that followed, that Kendra's soul had passed on after a suicide attempt and was replaced with the soul of her great-aunt, while stall maintaining Kendra's personality and memories. It was also revealed that Shiera's soul - as well of that of her husband Carter Hall (a.k.a. the original Hawkman) - had been reincarnated hundreds of times since the days of Ancient Egypt. Originally they were Prince Khufu and his consort Chay-Ara. Their souls became trapped in an endless cycle of reincarnation and reoccurring deaths at the hands of a treacherous priest - Hath-Set - who was also continually reincarnated and destined to kill them. The story of Carter Hall and Kendra Saunders in the DCTVU is virtually the same as in the modern JSA comics, save that Chay-Ara is specifically referred to as a priestess rather than a queen. As in the comics, Kendra did not believe in the reincarnation at first and resisted Carter Hall's attempts to convince her that they were soulmates and reestablish a romance with her. No explanation is given for how Kendra and Carter's wings function in this episode, though they are retractable and their emergence when falling is reflexive in nature. They are not technologically based, as the wings of their Golden Age counterparts were but neither do they seem to be biological as the wings of the Silver Age alien Hawkman and Hawkgirl were. Vandal Savage first appeared in Green Lantern #10 as an enemy of the Alan Scott Green Lantern. A caveman exposed to the radiation of a strange meteor, Savage was blessed with enhanced intelligence and immortality. Since that time, he has lived many lives and claims to have been many of history's greatest conquerors, leading whole armies in an effort to take over the world. The DCTVU version of Vandal Savage seems to be largely the same as his comic-book counterpart. The biggest difference is that his immortality is tied to his continually murdering the reincarnated spirits of Chay-ara and Khufu. In this, Savage has replaced the villain Hath-Set, but otherwise acts just like the Vandal Savage of the comics. Another minor change is that this version of Savage acted as an adviser to history's greatest generals rather than being said generals. Velocity 6 - the drug that Caitlin and Harry develop - appears to be a nod to Velocity 9. Velocity 9, in the comics, was a drug that granted super-speed but also caused premature aging, exhaustion and eventually death. It was developed by the post-Crisis Vandal Savage as a means of making money to fund his criminal empire. It was eventually developed into a non-lethal formula. Felicity looks at Barry's sketch of Vandal Savage and says he's "kind of rocking the Dothraki look". This is a reference to a barbarian tribe from the Game of Thrones books and TV show but may also be a reference to a disproved rumor that Jason Momoa - the actor who played Dothraki chieftain Khal Drogo - would be playing Vandal Savage in the movie Batman v. Superman. He was, of course, cast as Aquaman. The woman Oliver seems to recognize at CC Jitters is Samantha Clayton - a parallel to the comics character of Sandra Hawke. In the comics, Sandra Hawke was a former girlfriend of Oliver's who became pregnant and gave birth to his son without his knowledge. This son - Connor Hawke - eventually became the second Green Arrow. Samantha's son is named William. Felicity designed a magnetic arrow that is powerful enough to pull the guns out of several criminals hands. Caitlin compares Harry's idea for a formula to increase a speedster's top speed to adding nitrous oxide to increase the power of an combustion engine. Barry determines that one person was responsible for all the deaths at the docks based on the blood pattern. The knife used contained a cryptocrystalline - flint most likely. He later matches one of the knives Savage tried to use to kill Kendra and confirms that they are indeed flint. He also determines they are centuries old. Cisco's schematics for the new Arrow Cave called for copper wiring. This is why the new Arrow Cave suffers repeated power outages. Harry Wells' Velocity formula is meant to temporarily enhance The Speed Force within a speedster's system in the same way nitrous oxide can increase the speed of a motor vehicle. Caitlin says Wells' failures were due to his thinking of Barry's speed in mechanical terms rather than bio mechanical terms. Speedsters consume massive amounts of oxygen to increase their speed. In order to boost his speed, they need something that will introduce more oxygen into Barry's system, like an oxygen generator. Specifically, they need a chemical that is rich in oxygen that would release it as a nearly pure gas as it decomposes. They decide upon sodium chlorate. At that point, all they need is heat to release the oxygen, which a speedster naturally generates when they run. It is worth noting, however, that sodium chlorate is highly toxic in the real world and it is the basis for several chemical herbicides. Cop: Who taught you that?! Houdini?! Vandal Savage: Actually, I taught him. Damien Darhk: Huh. You brought arrows to a gun fight. Damien Darhk: (laughing) Oh! That was actually pretty clever! Kill them. Felicity (in a parody of Oliver's "Arrow" voice): 'Felicity, the magnetic-arrow gag will never work.' (switching to her normal voice) Ha! Yes it will, my love! Because I am really smart! And guess what, Oliver? It did work! Oliver: (over the comm) Felicity? Honey? It's a little hard to fight with you doing that in my ear! Felicity: (gasping) Oh I totally forgot that this was an open line! Keep doing what you're doing! Make smart decisions! Thea: Did I know we knew The Flash? Thea: We know The Flash. Okay. I didn't know we knew The Flash. Cisco: She's, uh, my, uh, new beautiful friend. Who kisses me. Occasionally. Thea: Right... umm.. I'm Thea. Oliver: I am happy. I finally have everything that I've ever wanted. Being with Felicity has given me a real sense of peace. Something I haven't had in a long time. Barry: Didn't you tell me that guys like us don't get the girl? Oliver: Yep. I was wrong. Felicity: (in response to Cisco and Kendra being metahumans) Oh, I did not see that one coming! Merlyn: Oh, I think there's a lot you didn't see coming. Kendra: If what everyone's saying is true - and it's beginning to seem like it is - my whole life just changed. And I am so not ready for that! Cisco: I hear what you're saying. I do. When I first learned about... my powers, I remember feeling that exact same feeling. And sometimes I still feel that way. And all I can say is... every day it gets a little bit more normal. I promise you. Green Arrow: We need to expose his wings. The Flash: I'm open to suggestions. Green Arrow: Oh, now you're listening to me? The Flash: It's your city, Oliver! Kendra: My name is Kendra Saunders. Carter: In this life. And I am - was - Carter Hall. But that is not who we are. Kendra: What does that mean? Carter: You're Priestess Chay-ara. I am Prince Khufu. And we're lovers. Soul mates. We've been partners for 4000 years. We're drawn to each other in each life, and after we die we reincarnate to find each other again and again and again. Cisco: You're 0 for 206 and you still think you're her best bet? Barry: Okay, so what we need to do is just find Savage and get rid of him. Carter: Well.. you can't get rid of him, my friend. Barry: Oh yeah? Watch us! Merlyn: It might be harder than you think. Barry: Is- is that the only way this guy knows how to enter a room? The Flash: We're too late. Vandal Savage: Something you're not used to saying very often, I'd imagine. The Flash: Oh, now you're listening to me? Green Arrow: It's your city! Vandal Savage: I used to enjoy slow deaths. Now I just find them boring. At the start of the episode, Barry clocks 1375 mph on the treadmill. Caitlin says his top recorded speed was just over Mach 2 (1522 mph) when he time-traveled at the end of Season One. Harry Wells estimates that Zoom is 3 to 4 times faster than Barry. Vandal Savage claims to have taught escapology to Harry Houdini. He may have used true magic to escape his bonds. Chay-ara is a Coptic name. In other words, ancient Egyptian. Cisco refers to Oliver and his allies as Team Arrow - the same nickname used by Felicity. Barry is aware of the existence of magic and knows something about what Team Arrow has been fighting in Star City, specifically saying that there's something mystical about Vandal Savage and that Oliver has more experience with that. John Diggle throws up every time he is moved with super-speed. Felicity refers to Barry having his back broken by Zoom in 206. Barry has some talent as a sketch artist. The picture of Vandal Savage Felicity finds was from 1975. Harry Wells' background is in technology, not bio-chemistry. Merlyn is now aware of Barry's secret identity. Cisco tells Barry about his vibe from 207 of Kendra as the flying woman in armor. Thea's blood lust - a reoccurring plot element from Season Four of Arrow - is referred to here when she seems to fatally shoot Vandal Savage. Cisco reveals his powers to Kendra and Team Arrow. Jay Garrick describes The Speed Force as a living thing and a gift that cannot be enhanced or replicated. According to Merlyn, The League of Assassins' records say that Vandal Savage was an adviser to both Genghis Khan and Julius Caesar. Barry throws lighting to taser Hawkman, as he last did in 206. He also creates a whirlwind to ground Hawkman in the same way he created an air cushion to catch Linda Park in that episode. Patty tracks Harry Wells to STAR Labs and shoots him. Reference is made to Dr. Tina McGee seeing Harry Wells robbing her lab in 204. Apparently Harry Wells knows a Dr. Tina McGee on Earth 2. Vandal Savage has killed Chay-ara and Khufu 206 times. He becomes more powerful each time he does so. Vandal Savage seeks an item called The Staff of Horus. In A405, Oliver Queen had an encounter with The Orb of Horus. Carter says that suddenly falling usually triggers the "emergence" of the wings and memories of Khufu and Chay-ara. Ollie theorizes that Kendra is drawn to significant items from her past the same way Carter and Vandal Savage were drawn to her and that the reason she moved to Central City was because the Staff of Horus was there somewhere. Barry refers to his fight with Grodd in 207 and his traveling through time, as he did in 123 and 115. Barry also refers to how he lost his powers until he focused on who he truly was, as in 107. The Velocity 6 formula works on Jay Garrick, who takes it to phase the bullet out of Harry Well's chest. He refuses to ever use it again, however. Oliver is not a regular church-goer, saying it's been some time since he's been in one when he and Barry arrive at St. Mark's Cathedral in Central City. It's been eight months since The Flash drink was introduced at CC Jitters. Oliver sees Samantha and her son at CC Jitters as he and Barry get a drink together. He last saw her at CC Jitters in F108. Before that, she was seen in A222 where it was revealed that Moira Queen bribed her to tell Oliver that she'd lost their child and move away. 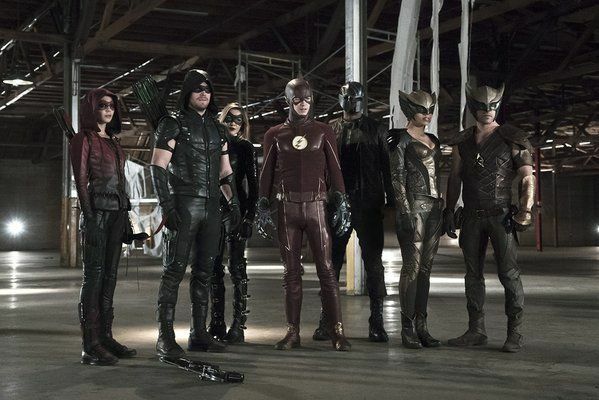 Easily the best team-up episode of all these characters to date. The only real flaw is that there isn't much time to introduce Carter Hall and Kendra seems to buy into her destiny way too quickly. Still, the script is solid and the performances are believable. And Vandal Savage is established as the sort of villain you just love to hate and a credible threat right away.